The pavilion-style Casco Bay Arena in Falmouth is intended to provide affordable ice time at peak hours for hockey players. FALMOUTH, Maine — Casco Bay Hockey Association officials said their new, $2 million pavilion-style rink will be ready for the season to start in mid-October. Casco Bay Hockey Association President John Veilleux said the Casco Bay Arena, on Hat Trick Drive behind Wal-Mart and next to the Family Ice Center, will be ready for hockey by the third week of October. “It’s getting better every day,” Veilleux said. The steel frame and concrete footings were put in last fall, and the rest of the work has been taking place since the spring, he said. Construction of the partially enclosed rink, which sits on the previous site of an old outdoor rink, began last August and stopped in the fall because of weather delays. Marco Giancotti, a member of the Casco Bay Arena board of directors, said continuing last fall would have put the slab at risk since it needs a long curing period. Veilleux said the delay allowed the club to “refine a lot of the things we wanted to,” including finding higher-quality LED lights for inside the rink. He said it will be a “four-season arena” that will provide more affordable ice time at reasonable hours for kids, and it will be open for hockey from October through March and during school vacations. During the warmer months, artificial turf will be laid down for sports such as indoor lacrosse. “This rink is to add ice to time to the peak hockey season,” he said. Giancotti added to have built a fully enclosed arena for year-round hockey would have added “at least seven figures” to the cost of the project, plus increased operating expenses. Boards, fences and wind-mesh will arrive for installation in the next few weeks. 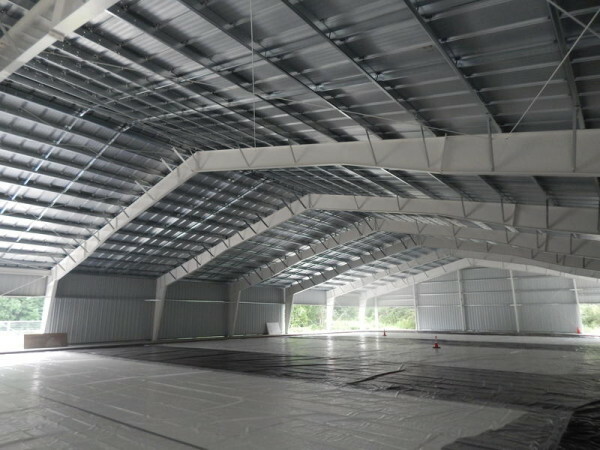 While a viewing area for family and friends will be warmed, the rink itself will be stabilized with the temperature outside, thanks to fans that will collect moisture from the air and push it out of the structure. Veilleux said it will be “a player’s rink,” built around the sport rather than the comfort of fans. Besides, school, team and league use, the rink will have supervised, unstructured ice time and time for designated pickup hockey. “We needed a rink that would get players on the ice and help grow the game,” Veilleux said. Veilleux said Casco Bay Hockey Association, a Portland-based youth hockey organization with more than 800 players and 150 volunteer coaches, has an agreement with Family Ice Center to manage the arena; Family Ice will supply Zamboni drivers and someone to keep the building maintained. A used Zamboni was purchased from the Clark Insurance Arena. There is still fundraising going on for parts of the project, including $75,000 to complete a mezzanine viewing area in the lobby. But the officials said that won’t prevent the arena from opening. “From the bank’s perspective we’re fully fundraised,” Veilleux said. He said more than $300,000 has been raised and there are “several interested sponsors” for the mezzanine level and the lobby. The Town Council approved the arena plan in late March 2014.